Welcome to the NEW DESIGN of the main page of DUMBBUM.NET! The rest of the site still needs some renovating, we are aware of it, and we are slowly working on it. We are slower than greedy contractors, although we don't get paid... How do you motivate someone greedy without paying them? Soon, we will offer you a fully functional website. We hope you'll enjoy browsing these available categories! Have Fun, Have Fun, Have Fun!!! 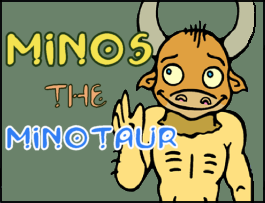 Our comic MINOS THE MINOTAUR is now 200 strips old!!! We have plenty of ideas and projects for Minos, just wait and see. It will Blow you mind away, more brutally than a Viking would! Now that's a party I'm eager to get invited to! Feeling like a brave warrior eager to reach Valhalla? Sure, whatever you say... Enter the Forbidden Realm of DUMB BUM CENTRAL and who knows what danger you may find! Here is hidden our OLD OLD OLD Main Page. KEPT ALIVE FOR THE NOSTALGICS! Dumb Bum wastes time on more than just Webcomics (that's why our strips are always delayed) Below we listed some features of our site. Check them out! Plenty of cool icons you can use on your sites for FREE based on Video Games. Updated Regularly. Getting Bored with the Internet? Think you've seen it all? I mean: ALL??? Why don't you TRY THIS!. Mythic Ancient Greek Tragedy abounds, as Minos struggles in his long captivity. The maze is no playground, there is nothing to do, but Minos is too dumb to get it. 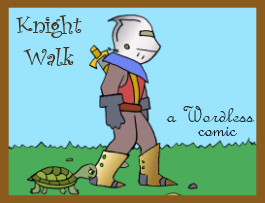 He offers more or less weekly adventures, and we URGE YOU to START READING THEM! A comic without words. It has shiny boots and the open road that awaits them... WATCH THE CURIOUS JOURNEY! 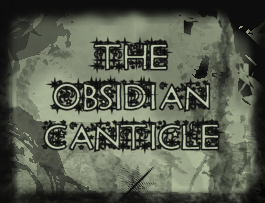 A sporadic comic set in a Dark Fantasy world. It features so many clichés: Magic, Demons, Swords, Bows, and characters that badly need therapy!!! FOLLOW THE ACTION HERE! No Super-Hero is like this one! He is retro, He is Afro, He is short on "Super"! Individual adventures that will freeze your brain in a time warp! 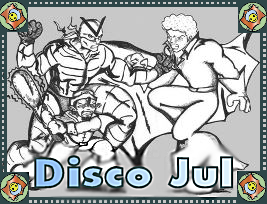 READ THE DISCO FEVERISH COMIC NOW! © Copyright of Dumb Bum Comics 1994-2014. All rights reserved.